On Sept. 25, 1977, 16 years before apartheid's end, Desmond Tutu stood before a crowd of 15,000 at the funeral of murdered black-consciousness leader Steve Biko in King William's Town, South Africa, and declared that white rule was finished. "The powers of injustice, of oppression, of exploitation, have done their worst, and they have lost," thundered the then 45-year-old bishop of St. Mary and St. James, Lesotho. "They have lost because they are immoral and wrong, and our God ... is a God of justice and liberation and goodness. Our cause ... must triumph because it is moral and just and right." Few could have known then that the unrest sweeping South Africa would be the beginning of the end of apartheid. But Tutu did. "That's the chief lesson I have learned," he told Time recently. "The texture of our universe is one where there is no question at all but that good and laughter and justice will prevail." Oct. 7 will mark two final achievements for a man who went on to become Archbishop Emeritus, a Nobel peace laureate and, as leader to a hundred commissions, charities and causes, a kind of conscience to the world. On that day, he will turn 79, and at the request of Leah, his wife of 55 years, he will retire. That will be a relief for oppressors from Afghanistan to Zimbabwe. But for millions of others, a world without Tutu will be a bit darker, a little more dull. His official legacy will be the Desmond Tutu Peace Centre, which he founded with Leah in 1998 to foster tolerance and understanding in war, but he will not have an active role in its operations. His unofficial legacy will be his life and the story of how this tiny pastor with a huge laugh from South Africa became our global guardian. Desmond Mpilo Tutu was born in the black township of Klerksdorp in northern South Africa in 1931. Mpilo means "life" in Tutu's native Xhosa and was the defiant name chosen by his grandmother for a sickly boy who later contracted polio. After he overcame the disease, apartheid tried to hobble him. Tutu's biographer John Allen describes in Rabble-Rouser for Peace how throughout Tutu's early life, South Africa's racist rulers destroyed "community after community, institution after institution" in which he lived or studied. Tutu's teaching career ended when he refused to submit to a new racist curriculum. Klerksdorp was bulldozed in the 1950s for being too close to a white area. From his doting mother, Tutu learned empathy. But from the injustice around him, he took righteous fury. "He hates confrontation," says Allen. "But when he sees people suffering ... there is this extraordinarily articulate, scathing anger, a fierce determination to speak out." The rock musician and campaigner Bono says, "The Arch"  as he is universally known  "ties tight faith, justice and passionate earthiness. He takes on the most sophisticated structural wrongs and breaks them down with a pure focus." 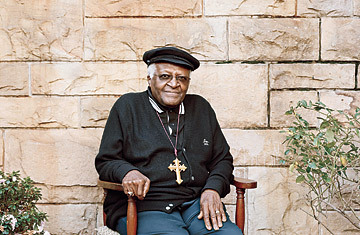 Tutu evolved a philosophy of rebellion that fuses Christianity with African sensibility. "God is not evenhanded," he summarizes it today. "God is biased, horribly in favor of the weak. The minute an injustice is perpetrated, God is going to be on the side of the one who is being clobbered." In the South African context, that put Christianity at odds with apartheid. Tutu also drew on the African concept of ubuntu, which describes a world without division, in which the worth of the whole is determined by its parts. Ubuntu requires a pastoral approach and forgiveness even for your torturers. It also makes nonsense of separation between colors or religion and politics. It is confidence, too, that gives Tutu his talent as a showman: the ability to read an individual or a crowd, open himself completely to them and come alongside them. As the author John Carlin once wrote, "There's no one who rattles our nonbelief as he does." At an opening concert for South Africa's soccer World Cup in June, he stole the show from a host of international stars simply by appearing onstage in a Bafana Bafana jersey, scarf and woolly bobble hat  and smiling and dancing. During apartheid, Tutu would capture crowds of a different kind, time and again walking into standoffs between protesters and armed police and persuading both to walk away. Tutu's secret, then, is no secret at all. It is faith. Good and laughter and justice will prevail. "In the end," says Tutu, "the perpetrators of injustice or oppression, the ones who strut the stage of the world often seemingly unbeatable  there is no doubt at all that they will bite the dust." The thought still delights him. "Ha-ha-ha-ha-ha!" he roars. "Wonderful! Wonderful! Wonderful!"